New climate model projections of the world's coral reefs reveal which reefs will be hit first by annual coral bleaching, an event that poses the gravest threat to one of the Earth's most important ecosystems. 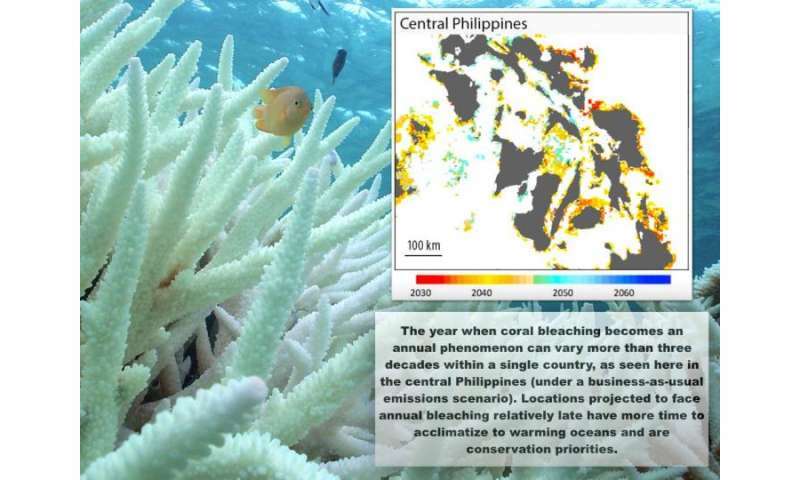 These high-resolution projections, based on global climate models, predict when and where annual coral bleaching will occur. The projections show that reefs in Taiwan and around the Turks and Caicos archipelago will be among the world's first to experience annual bleaching. Other reefs, like those off the coast of Bahrain, in Chile and in French Polynesia, will be hit decades later, according to research recently published in the journal Scientific Reports. "These predictions are a treasure trove for those who are fighting to protect one of the world's most magnificent and important ecosystems from the ravages of climate change," said Erik Solheim, head of UN Environment. "They allow conservationists and governments to prioritize the protection of reefs that may still have time to acclimatize to our warming seas. The projections show us where we still have time to act before it's too late." If current trends continue and the world fails to reduce greenhouse gas emissions, then severe bleaching will occur every year on 99 per cent of the world's reefs within the century, according to the study. The Paris Agreement's aspirational target of limiting global temperature increase to 1.5 degrees provides a safer, but not an entirely safe space for coral reefs. Even if emission reductions exceed pledges made by countries to date under the Paris Agreement more than three quarters of the world's coral reefs will bleach every year before 2070. It takes at least 5 years for a reef to recover from a single bleaching event. "Bleaching that takes place every year will invariably cause major changes in the ecological function of coral reef ecosystems," said study leader Dr. van Hooidonk of NOAA and the University of Miami. "Further, annual bleaching will greatly reduce the capacity of coral reefs to provide goods and services, such as fisheries and coastal protection, to human communities." The need to act is clear. Between 2014 and 2016, the world witnessed the longest global bleaching event ever recorded, which killed coral on an unprecedented scale. In 2016, bleaching hit 90 per cent of coral on the Great Barrier Reef and killed more than 20 per cent of the reef's coral. The new study shows that, on average, the world's reefs will start suffering annual bleaching in 2043. About 5 per cent of them will be hit a decade or more earlier, while about 11 per cent will suffer annual bleaching a decade or more later than this date. If emission reductions exceed pledges made by countries to date under the Paris Agreement, coral reefs would have another 11 years, on average, to adapt to warming seas before they are hit by annual bleaching. If such emissions reductions become reality, many high and low latitude reefs in Australia, the south Pacific, India, Coral Triangle and the Florida Reef Tract will have at least 25 more years before annual bleaching occurs, buying time for conservation efforts. However, reefs near the equator will experience annual bleaching much sooner, even if emissions reductions pledges become reality. "It is imperative that we take these predictions seriously and that, at the very minimum, we meet the targets of the Paris Agreement. Doing so will buy time for coral reefs and allow us to plan for the future and adapt to the present," said Mr. Solheim. Predicting when and where annual bleaching occurs will help policymakers and conservationists decide which reefs to prioritize. "Reefs that will suffer annual bleaching later - known as climate "refugia" - are top priorities because they have more time to respond positively to efforts that seek to reduce bleaching vulnerability", said Dr. van Hooidonk. Such efforts include reducing land-based pollution, halting overfishing and preventing damage from tourism. Coral reefs, which are already under threat from overfishing and tourism, are especially vulnerable to climate change because they are easily affected by warm water. When sea temperatures rise, the algae that give coral its bright colours leave their host, causing it to look white, hence the term 'coral bleaching'. The loss of algae, which provide coral with much of its energy, make corals vulnerable to starvation and disease. Known as the world's underwater cities, coral reefs provide hundreds of millions of people with food, income and coastal protection. They are home to at least one quarter of all marine life and they generate an estimated $375 billion per year from fisheries, tourism and coastal protection. "We are going to need to be much more innovative and proactive if we want to see coral reefs thrive into the next century," said World Wildlife Fund (WWF) lead marine scientist and study co-author Dr. Gabby Ahmadia. "Conventional conservation is not going to cut it against the impacts of climate change. We need to embrace the new climate reality to guide efforts to save our oceans".